When you are applying for jobs, what’s the one thing that’s on your mind the whole time? Well, I can’t speak for everybody, but I know that when I was applying for positions my number one concern was how many other people were applying for the same position. I would assume that a ton of people were applying for the position I wanted so I would go out of my way to make sure I was standing out. That can be difficult though when you’re a writer applying for a writer position in a sea of other writers. All candidates are going to try to be snazzy with their writing, so you need something else that sets you apart. That is the best time to answer a job post with a video resume or a video post. No matter what industry you are in or trying to get into, using a video resume in response to a job post is a great way to set yourself apart from the competition. Why? How many times have you responded to a job post with a video resume? Chances are not very many times. That’s because employing video resumes is fairly new. If you haven’t ever used one, then the chances of an employer or a recruiter receiving an influx of video resumes is fairly slim as well. So if you respond to a job post with a video resume in addition to a paper resume, cover letter and samples of your work then you automatically set yourself apart from the competition. A video resume is a great chance for you to show the employer your passion for your work or the industry you are in as well as your communication skills. In a paper resume, you can easily say that you’re a great communicator. However, don’t you think it’s a better idea to actually show this employer how great your communication skills are? You can do that easily with a video resume. 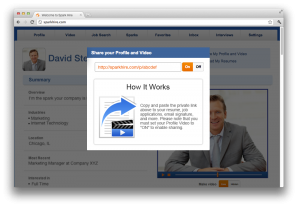 You can make the process of creating a video resume even easier if you do it on Spark Hire. When you sign up for Spark Hire, for free mind you, you can record a 60-second video resume right there on your lap top or desktop. You don’t have to download any additional software or go through any long processes. You simply log onto Spark Hire and record. Once you have perfected your video resume and covered all the points you wanted to cover you can send your video resume along to any employer easily. When you email the employer your paper resume and your cover letter, simply add your video resume as a supplementary piece. It’s short, to the point and turns you into more than just a resume. It turns your resume into you. So if setting yourself apart from the competition is on your agenda, and why wouldn’t it be, then get started on creating your video resume today on Spark Hire.